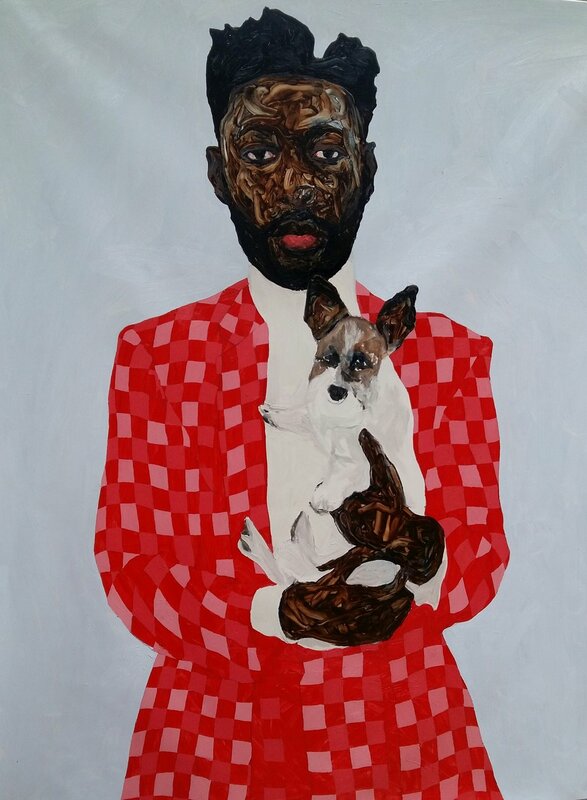 Amoako Boafo paints figures of the African Diaspora as "a celebration of Black life." His figures are dense flurries of brushstrokes amidst smoother patterns and monochrome backgrounds. The thickly applied paint amplifies the presence of the figures. As Sharon Mizota writes, "This technique not only belies the literalness of the designation "black" but also makes the figures pulse with energy." Noir (2018) is a painting of joy that works to reverse the negative associations of black (noir). Towards that end, the luminosity of the figure's black turtleneck sweater helps to complicate our understanding of the color black. They are shown lost in a moment of delight and vulnerability, complete with closed eyes and a toothy grin. The turtleneck and a single dangling earring are signs of Western fashion that hint at the complicated realities of life in the Diaspora. Black and White Stripes (2018) shows a figure off-center, looking back over their shoulder at us. The negative space to the left implies forward momentum and the backwards glance is assertive, questioning. The title no doubt refers to the figure's black and white patterned shirt, but it also hints at the way the figure cuts a dark, near-black, vertical in a field of white. It's a relatively subdued piece where, aside from the blue-grays on the figure's cheek and eyebrow, the only kernel of color is the deep red of their bottom lip. In Hands on Table (2018) we see someone in a white floral print shirt sitting at a table, their gaze fixed elsewhere, their arms and hands resting on the tabletop. The thick brushstrokes of the arm, especially in contrast to the smoother handling of the tabletop and shirt, lend the sitter's flesh a visceral weight and gravity-- a presence. The way Boafo presents his subjects alone and without any visual context encourages us to contemplate them individually, something not always promoted by popular media. He says this work "invites us for a reflection on Blackness and asks for an understanding of its diversity and complexity."